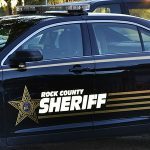 A Janesville man was seriously injured Tuesday morning when a semi-truck and an SUV collided in Rock County. The crash occurred shortly before 5 a.m. at the intersection of East State Highway 11 and Beloit Avenue, near Janesville. The Rock County sheriff’s office reports the SUV was driven by a 30 year old man from Janesville. The SUV collided with a semi-truck that was driven by a 24 year old man from Gary, IN. The SUV sustained heavy damage and the driver had to be extricated from the vehicle by emergency responders. The driver of the SUV was transported to a local hospital with serious but non-life-threatening injuries. The driver of the semi sustained minor injuries and was also taken to a local hospital, according to sheriff’s officials. East State Highway 11 was closed to westbound traffic for approximately 30 minutes while emergency personnel secured the crash scene.